The classical concerts offered in our website take place in some of the most beautiful concert halls in Vienna. Concert halls include the Golden Hall in Musikverein, where the famous Vienna New Year's Concert takes place, the Vienna State Opera, the Hofburg and Schoenbrunn Palace, Kursalon Vienna, St. Annes Church or Vienna Mozart House. It is not only the classical music that contributes to the great experience, but also the beautiful settings of Vienna's famous Concert Halls. 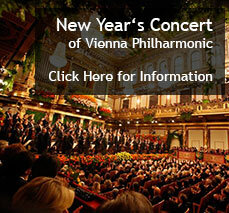 Viennaconcerts.com is the first online ticket office in Vienna to offer all Strauss and Mozart Concerts in one place. Mozart composed many of his best-known symphonies, concerts, and operas while living in Vienna. Johann Strauss, also known as "The Waltz King", composed hundreds of waltzes and was responsible for the popularity of the waltz in Vienna. All classical concerts in Vienna offered in this website include the most popular and famous compositions of Strauss and Mozart.